Cyber Security – or rather cyber insecurity – is very much in the news. Pretty much daily we hear of another security breach with thousands, even millions, of people affected. Yet surely we have the technology to enable the IT professional community to protect us from all this, do we not? 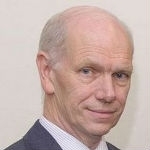 John was appointed Director General of Knowledge and Innovation in February 2013. He was Vice Chancellor at Cranfield University from December 2006.